Hanes Men's Big & tall Crew Neck T-Shirts is everyone's favorite wardrobe staple. These crew neck t-shirt provide great comfort and quality and is now available in larger sizes. The Hanes Big and Tall Crew Neck T-Shirts is made of soft,ring-spun cotton with a comfortable crew-neck,short sleeves and easy fit. The ComfortSoft cotton knit is treated for even more softness. The neckline is tagless for comfort, and designed to lay flat for a neat appearance under anything. 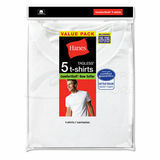 These t-shirt has a generous length for a stay-tucked hem. 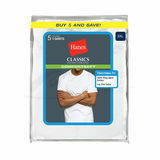 Hanes Men's Big & Tall Crew Neck T-Shirts are very nice. They don't shrink like a lot of other brands. They are soft, very white and made well.